Singapore's Prime Minister Lee Hsien Loong on Wednesday reshuffled his cabinet to regain confidence of voters. Five ministers from the cabinet have stepped down after the victory of the ruling party, People's Action Party (PAP), at the general election this month, which was a sharp drop. Eleven out of fourteen ministries gets new leaders. Mr. Lee said in a press conference on Wednesday he was aiming for "a comprehensive reshuffle, not just incremental changes." Finance Minister Tharman Shanmugaratnam, 54-year-old, elevated to deputy prime minister. He is also given the manpower portfolio. He has been also appointed recently as the chairman of International Monetary and Financial Committee. Chan Chung Sing, 42-year-old neophyte lawmaker given the portfolio of community, youth and sports. He is a former army chief. Law Minister K. Shanmugam, 52-year-old, will replace foreign minister George Yeo, 56, and he will hold both the portfolios. Founder of modern Singapore, the elder Lee, father of Prime Minister Lee Hsien Loong, Lee Kuan Yew, would relinquish the position as minister mentor. He will also relinquish his post as chairman of Singapore's sovereign wealth fund, Government of Singapore Investment Corp.
Former prime minister Goh Chok Tong would relinquish as senior minister. He will be giving up his position as chairman of the central bank and will become a senior adviser to the MAS. Prime Minister Lee will hold the position of chairman of the sovereign wealth fund. Deputy Prime Minister Wong Kan Seng will retire from the post, and also National Development Mah Bow Tan. Transport Minister Raymond Lim is also said to retire from his cabinet posts. Average minister's age in the new cabinet is 52. Youngest minister is 42. This year the economy of the country is expected to grow 4 to 6 percent. In March the consumer prices rose by 5 percent from a year earlier. In January it was close to a two-year high. On Saturday, May 21, the new cabinet will be sworn. 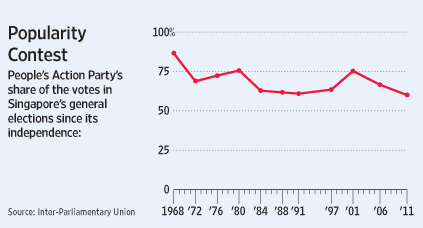 PAP has been dominating the country since independence in 1965. PAP's popularity sees a continuous drop. In 2006 election it could garner only 67 percent of the popular vote. Secretary-general of opposition Reform Party, Kenneth Jeyaretnam, failed to win his seat in the election. He said, " PAP have a complete dearth of talent." Singapore is considered to be a resource-poor island. It's total population is 5.1 million.